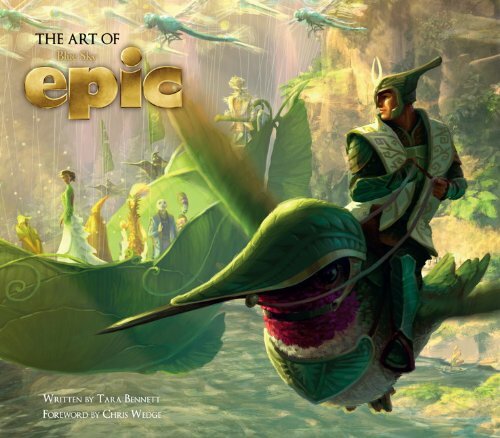 Here's the artbook for Epic, the film from Blue Sky Studios. It's 144 pages, hardcover, from Titan Books, whose earlier artbook was The Art of the Croods. It's a nice artbook with character designs and concept art. The costume designs for the soldiers are quite stylish. There are a lot of interesting forest characters such as those inspired from bugs, plants, flowers and other insects, but unfortunately they aren't dedicated more space. The illustrations are wonderful. I really like the colors of the sunlight in the forest. The environment art are pretty realistic in style as compared to the characters. The writeup is an enjoyable read that covers the design process, talking about the characters and how they evolved and a bit on the research for their designs. There are some typos though. Nice book overall, but you would have to watch the movie first to like the book better. I like the book, it's nice if you saw the movie. But it's not better then a Pixar art book.